Trust No One, and Is Love Enough? These are 2 things that we have come to adore about this series and those same thoughts really pull us through this entire 4th installment. When we last left these characters, everyone had gone to rescue Beth from Daedelus and had trusted Blake to get them in and out safely. Of course we know that Blake CANNOT be trusted, and he burned them again. Katy is now trapped inside and has been captured. She’s going to quickly find out what Beth went through and figure out how to survive. Daemon of course is having a hard time being on the outside since he’s now admitted that he loves Katy and that she’s his world. He’s so adamant about getting to her that he even willingly goes against the Luxen and decides that he’d rather be with her and have to leave the community – so that’s what he does. This story not only takes us through Katy’s journey inside Area 51, but brings Daemon along for the ride. We learn that the Luxen and Arum aren’t the only ones out there. Hybrids are more common than we know, and there’s an interesting twist when a Hybrid and Luxen mates. aka….ORIGIN. Once these 2 get one challenge behind them, they face a world of struggle, and it’s really interesting where this story takes us. We think that we may be over one hurdle only to get double crossed by someone that you’d never expect and then find that things are even worse than they seemed just moments ago. The way that this 4th book ends is great since the anxiety was really built up and hedged in such a way that you really wish that the next book was available for download right now. This installment has certainly solidified my opinion of Jennifer L Armentrout as a great contemporary/fantasy author since she’s managed to bring a perfect blend of Sci-Fi and YA Adult into this story that it seems real while giving you that fantasy edge. 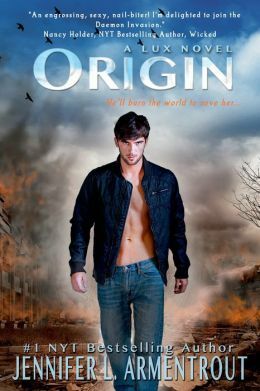 This entry was posted in fantasy, Reviews and tagged Fanstasy, Jennifer L Armentrout, Lux Series, Origin by iscm13. Bookmark the permalink.